We recently listened to your podcast at SAD Mag. Congratulations on your upcoming job as editorial designer for SAD! How did that come about? Is it full time? Thanks! Another IDEA grad connected me with the Creative Director, Pamela Rounis (who is also an IDEA grad!). SAD, like most editorial work, isn’t full time. Geist, Adbusters and SAD are a world apart from the previous design gigs you had for Yaletown beauty shops. Tell us what you find fulfilling about your recent magazine work and did you get these jobs through word of mouth and networking? It’s so inspiring to be able to work alongside talented editors, writers, illustrators and photographers. You all work together to create a beautiful piece that people will be able to hold in their hands and flip through, which I think is really special. I definitely found my design niche, and was able to find more work just through word of mouth once I found my footing. You graduated from IDEA School of Design in 2014 "not wanting to be a designer". What advice would you give to illustrators who may look to you for hope to be able to do design work in the future? One thing I didn’t mention in SADCAST is that my desire to push away from design came from not really believing I could do it. You’re in classes with such hugely talented individuals, it’s intimidating! What I always tell illustrators is your ability to do illustration makes you a stronger designer, and vice versa. You have the eye and the talent, you just have to push yourself to find things that you’re passionate about. Many of our students do spot illustrations for Capilano Courier and some end up working there after grad as layout designers. Do you have some old spot illustrations for us and how was the experience there as a layout designer? I loved my time at the Capilano Courier, it was such a transformative job for me. I really used my time there to figure out the basics of layout design and start exploring how to make that more creative. It’s also a great way to figure out if you can work well under pressure, which you certainly need to be able to do! 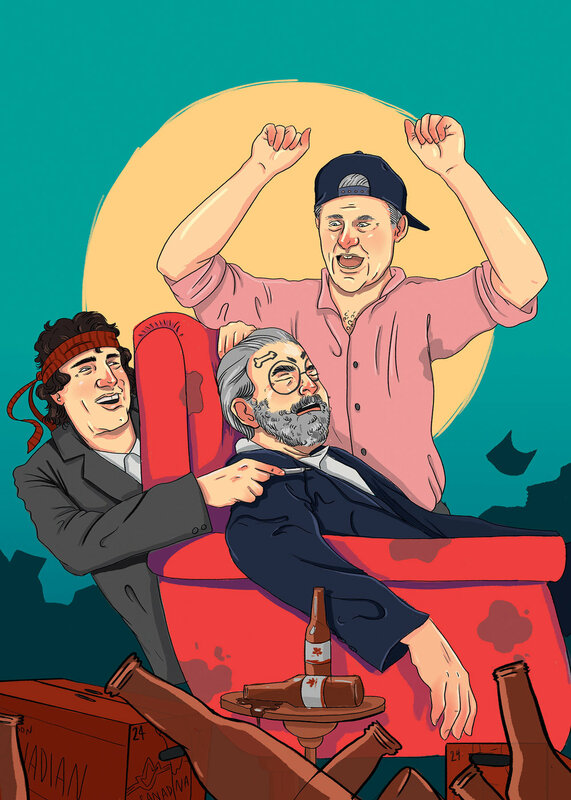 Cover for the Capilano Courier, Volume 48 Issue 22 “Electile Disfunction”. I was asked to create a piece that showed a “political party”. A spot illustration for an article on ethical clothing. Specifically the canadian goose down coats. I actually had a column for a short time in the Capilano Courier, covering geek news. 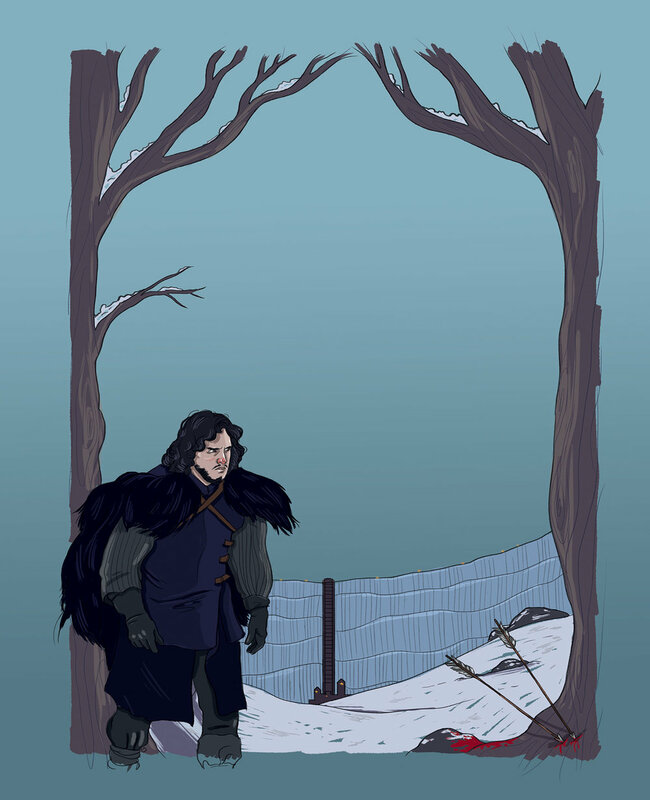 This was a full-page illustration that featured Jon Snow from Game of Thrones. Your website says, "As the art director for Adbusters Magazine, I worked with the team to create layouts that broke the rules of design and inspired anarchists around the world". What was the experience like working there and got any favourite pieces? Oh man, Adbusters is a world of it’s own. Working alongside Pedro Inoue, the creative director, I was able to take a step back from the computer screen and really connect with what I was creating. I saw the voice and strength design can bring to movements, and how breaking the rules could create something that inspired. Adbusters describes itself as "a global network of artists, activists, writers, pranksters, students, educators and entrepreneurs who want to advance the new social activist movement of the information age." Could you elaborate, in particular, “Make Believe World” and “Cool Fascismo”? The cover of Cool Fascismo. I worked with Pedro Inoue and his brother Gil Inoue on this one, passing it back and forth until there was just enough grit and detail. An interior spread from Cool Fascismo featuring a quote by Sebastian Haffner. I treated all the typography in Adbusters to make it pixelated and raw. Printing quotes out, crumpling the paper and scanning them back in. An interior spread from Bye Bye American Pie. Adbusters was where I discovered my love for textures and the way they can transform an image. What was your experience like working at Geist, a Canadian literary magazine with a great sense of humour? Got any favourite pieces? Geist is one of my favourite publications, the team is so fantastic! One of the most interesting things I found about working in editorial is that the teams are surprisingly small, with everyone working closely sharing drinks, lunches, coffees and maybe some stress tears. Cover for Geist Issue 107 featuring the work of Janieta Eyre. I always feel really fortunate to be able to help showcase the work of Canadian artists. Interior spread in Issue 104. I had the opportunity to work with a found photo archive. In IDEA I failed, a lot. I failed constantly. I’m so glad I failed so much, because I really learned and grew from those experiences. I’d have to say my fondest memories were the late nights with classmates, shaky trips to Tim Hortons and my time being mentored by professor Jeff Burgess. Students now have portable MacBooks. Got any advice to students who prefer going straight home after class to work solo? My advice to anyone trying to work from home is to set up a work area that inspires you. Fill it with greenery, prints from your favourite artists, and an area to work hands-on and get messy. I have been lucky enough to have been a part of a few awards, including a Gold National Magazine Award (Geist, best photojournalism) and Adbusters receiving the Curry Stone Design Prize while I was working there. Most of my time is devoted to work, but I do sell a few prints here and there! 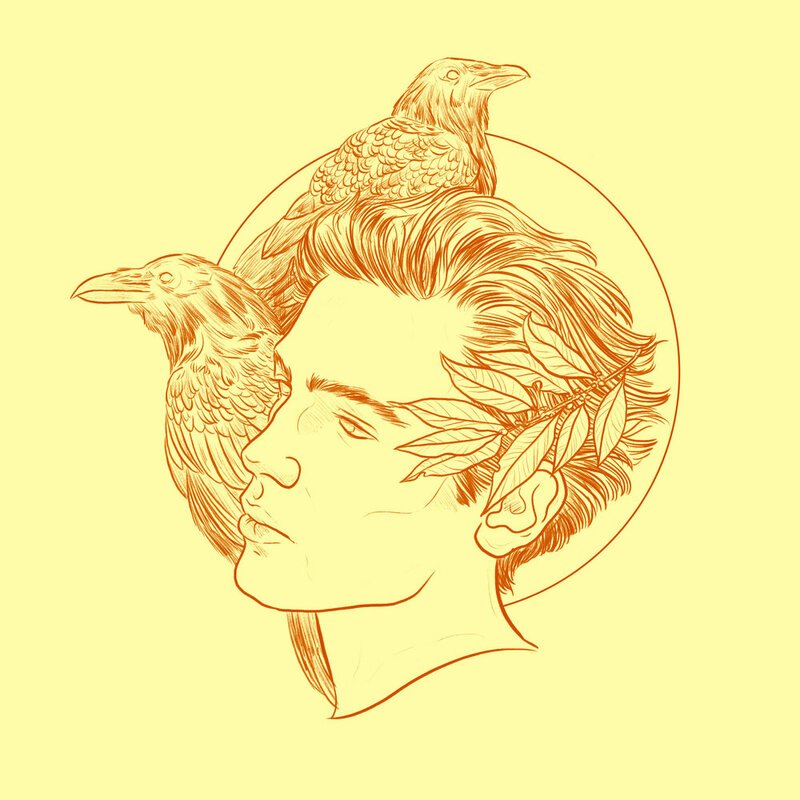 I’m currently working on a tarot deck, which will hopefully be released sometime next year. Got a sneak peek for us?